PHILADELPHIA – The Philadelphia Flyers always have embraced big, strong, tough players. Sami Kapanen may not be big or strong, but you'd be hard-pressed to find a tougher, more determined player than the 5-foot-10, 185-pounder. Playing mostly on the fourth line this season, Kapanen scored a goal late in the first period of Game 3 of the Flyers' 6-3 victory against the Washington Capitals on Tuesday. It was a typical goal for the speedy puck hound. In deep with Jim Dowd on the forecheck, Dowd intercepted a break-out pass in the high slot and dropped the puck for Kapanen. He one-timed it past Cristobal Huet before the Capitals' goalie could flinch for his first playoff goal since May 20, 2004. While he once posted five straight 20-goal seasons in the 1990s with the Carolina Hurricanes, the 34-year-old Kapanen no longer earns his playing time based solely on his offense. Instead of using the speed that earned him a pair of fastest-skater titles for offense, he uses it to be a puck hound on the forecheck and the penalty kill. Call it a cliché in that he does all the little things that don't show up in the box score, but his value goes far beyond the simple math of a score sheet. "He always gives 110 percent," teammate Riley Cote said. "He works hard every shift five-on-five and he's a great penalty killer. Such a great skater, and he moves so well, good positioning. He does everything well. He hits. There's a reason he's been around the League as long as he has. He's just a good, hard-working player. "He finishes checks. … You'd never know he was 5-9, 5-10. Every game he brings it. He's just a competitor, a warrior, in every game." He played averaged a little more than 13 minutes per game in the regular season, and didn't play in Game 1 of the Flyers' Eastern Conference Quarterfinal series with the Capitals, and he played just nine minutes in Game 2, but that number rose to 12:01 of ice time in Game 3. 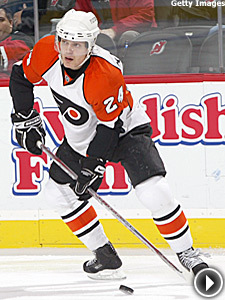 He also has played an average of 3:16 on the penalty kill, during which the Flyers have killed off 14 of 16 Caps advantages. "Sami always plays hard," said Dave Brown, the Flyers' pro personnel director today, but a former tough guy himself during his NHL career. "Sami plays hard all the time. And we wouldn't expect anything different from him. We know how he plays." The moment that defines Kapanen's reckless style happened in Game 6 of the Flyers' Eastern Conference Semifinal series with the Toronto Maple Leafs in 2004. Moved back to defense due to injuries, Kapanen tried holding a puck in at the Leafs' blue line in overtime. Putting his own well-being at risk, Kapanen stretched for the puck, but left himself vulnerable to a crushing hit from Toronto's Darcy Tucker. Rather than stay down, Kapanen miraculously found his way back to the bench. Jeremy Roenick jumped on for Kapanen and scored the series-clinching goal on the next shift. "If he stays down, they blow the play dead," Roenick said that night. "As long as the guy is trying to get up, they usually let it go. Sami is tough. He got up." Showing his toughness, Kapanen came back for Game 1 of the Eastern Conference Final, and played both forward and defense against the Lightning. When he wasn't playing in the first defense pairing, he was killing penalties and part of a dogged checking line. He's doing much the same now. "I just want to go out there and bring the energy and play smart and play good, two-way hockey," Kapanen said. "If I have the opportunity to score goals I'm going to go for it, but at the same time I know I'm out there to bring that energy and the skating and the smartness of playing a two-way game." Kapanen has played through a litany of injuries over the last few seasons, mostly due to his shoulder and knee, and contemplated retirement before signing a three-year contract extension early last season. He might spend more time in the training room than on the ice, but he's still the first player into the corner when there's a puck battle to be won. "Sami's always been a tough player that way," Brown said. "He'll play in any kid of physical situation. He finishes his checks hard and he's a good skater. He's always on the puck. He's always played that way." While he might not wear a letter on his sweater, his voice is a loud and respected one in the locker room. "Being one of the older players, I have to keep doing the same things and hope everyone is going to do it and follow your lead," Kapanen said. "Everyone notices when guys play through injuries," Cote said. "Guys notice that and it's contagious. If you have guys that have been around doing things like that, the younger guys feed off that." This time of year, Kapanen is more than willing to provide whatever kind of motivation his team needs. "It's that time of the year you want to get the wins," he said. "It's so much easier to get ready to play that kind of hockey than in the regular season. I don't think it matters if the player is 5-5 for 6-5, it's the postseason. You sacrifice your body."